Batman is one busy guy. Gotham City is so rife with criminals and super villains, that he really doesn't have much time to spend foiling bad guy schemes outside of his home town. Of course, that changes a little bit in Zack Snyder's Batman v Superman film, where the vigilante decides to exchange blows with the Kryptonian powerhouse, but we still feel that the rest of the world's cities are severely lacking in superhero presence. It doesn't have to be that way though. 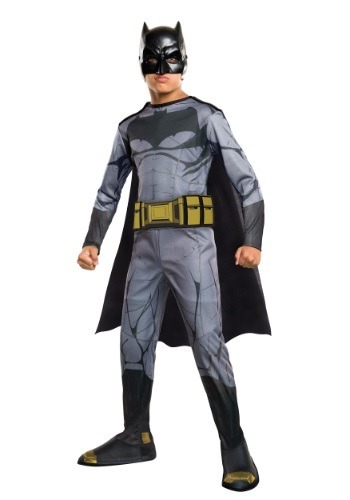 Your teen has the crime fighting ambition of a superhero, so perhaps all he needs is new costume to ignite his heroic spark. This Teen Dawn of Justice Batman Costume recreates the costume worn by Ben Affleck (or Bat-fleck, if you will). The main jumpsuit comes with printed details, like rippling muscles and the Frank Miller inspired Bat-symbol on the front. It even has printed armor details to give that combat-ready look from the movie. To top it all off, the costume includes a cape which can be used to dynamic effect when standing in front of a fan. Just in case all of that wasn't enough to get a kid ready for some crime fighting, the printed utility belt is based on the signature accessory from the comic books. Just make sure to teach him tons of sweet martial arts moves before you send him out to do battle against the forces of evil.